Going along with the theme of battlefield-home front connections, the 79th Pennsylvania consistently played rather remarkable roles in elections back home in Lancaster throughout the war. It began as the regiment left Lancaster in October 1861 with some companies voting on the train while heading west toward Pittsburgh. (Their votes actually influenced the outcome of two row offices, but were thrown out for process irregularities after a legal battle.) It continued in early February 1862 as part of Lancaster City's annual elections for various local positions, the most important of which was the mayoralty. The incumbent was Mayor George Sanderson, who add on to his three successive terms as mayor (since 1859). I think we can describe Sanderson as an old-fashioned Democratic party boss, but he definitely was the editor/owner of the Lancaster Intelligencer and a borderline peace Democrat (sometimes probably crossing the line). His main talking points were a brand of Constitutionalism that might be recognized as a cousin of today's libertarianism and a bitter conservatism on matters of race that apparently played well with Lancaster City's German and Irish immigrant community. By bitter conservatism, I mean that a direct and severe stance against the equality of African-Americans dominates many of Sanderson's speeches and editorials. We await the result of the election with no little interest. In times like these, the indomitable spirit of our people should be displayed on every election ground, and in every contest, by the election of men whose loyalty is above suspicion, and whose patriotism is of an unquestionable stamp. The people of Lancaster should, in vindication of their own character, rebuke George Sanderson, and they will find in Dr. Cassiday a true exponent of their sentiments. A 2004 LCHS Journal article by Mike Smith: "The Intelligencer : the voice of Lincoln’s Lancaster County tormentors"
I missed posting this a couple days ago, but readers of the Lancaster Daily Evening Express were treated to this account of the Confederate retreat from Bowling Green (forced by Grant's successes at Forts Henry and Donelson). 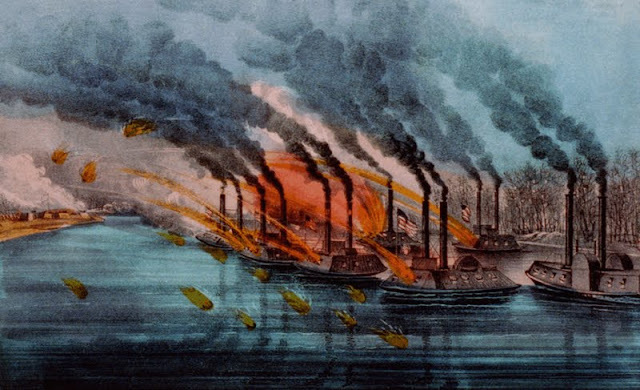 The Union troops involved had leapfrogged McCook's division and the 79th Pennsylvania, who followed along a week later. On February 14, 1862, the 79th Pennsylvania left its camp of two months at Munfordville to join the rest of the armies in the West, which were pretty much already in motion. They would get one of their toughest marches of the war out of the early, trudging over very rough roads in deep mud. The Lancaster County Regiment actually started by marching north, instead of southwest towards Bowling Green. 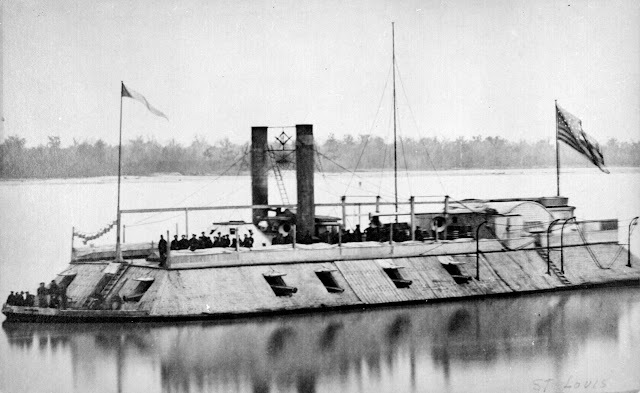 Buell had originally planned to support Grant's army by sending McCook's division north to Louisville where steamboats would be waiting to take them down the Ohio River and up the Tennessee River. A day into this journey, however, after Buell became much more optimistic about an overload approach due to the fall of Bowling Green, the order was countermanded, and the 79th Pennsylvania returned to Munfordville. 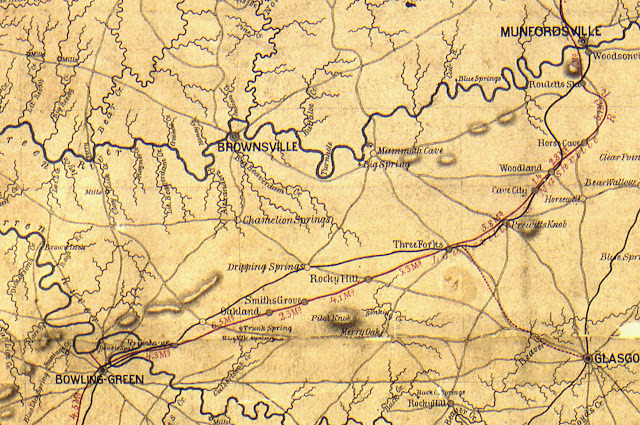 The regiment spent the next week traveling the fifty miles or so to Bowling Green using a combination of the railroad and turnpike, stopping occasionally to help repair the railroad or visit caves along the way. Col. Hambright's regiment arrived just opposite Bowling Green on February 23, but it wouldn't be until February 28 that the regiment actually crossed the river to enter the town. This morning at an early hour our Division began to move toward Louisville, Our Brigade moved at 11 a.m. The pike is in a bad condition, teams are continually stalling, one wagon upset & another with the tongue broken out. The marching was very hard & when we encamped there was but 12 men in line. We made fires on the left of the R. R. under shelter of a woods. Our wagons are not here yet. Some of the men came in at 9 a.m. The ground is still covered with snow. Yesterday we met the cars, they were loaded with mules & wagons. Our wagon came up at noon, when there was a regular rush for meat. Receive orders at 3 p.m. to fall in & march back on the same road we came. Halted 2 miles north of Bacon Creek for the night. Started at 9 a.m. & marched 2 miles south of Green River. Wagons came up at 3 p.m. when we pitched our tents placed rails on the ground & covered them with straw. Tonight men & teams were detailed to go to Munfordsville for provisions. This morning we were called early & told to have 3 days rations in our haversacks & be ready to march at 7 a.m. Left camp at 8 a.m. & marched down the pike to its end which was 4 miles. After that the road was very bad. Below Horse Cave we marched on the R. R. which was much better traveling. Stopped at Woodland Station to rest for half an hour. After we started down the R. R. we found the Rebels had torn up the ties & burned some of them when we had to take the mud for it. The Depot at Woodland as well as the hotel, stabling & Depot at Cave City were burned by Rebels. We came to Glasgow Junction & took the R.R. again. We soon came to where the pike commenced took it, marched 1 and ½miles, camped & called it Hambright. We were all nearly worn out & scattered so much that when they came to camp there was but 10 men to stack arms. Last night I went to a cave close to camp. We went 50 feet down a ledge of broken rocks at the foot of which is a good spring of water, which runs into a trough, and buckets coming down by windlass from the top are filled with water, & drawn up on a wire. We went back ½ a mile into the cave but had to return as our light was burning low. Our wagons came in at 2 a.m. The men in some of the Regiments went out and shot some sheep, which was very disgraceful considering the cause for which we are fighting. Last night after we had went to bed we were called out to cheer for the taking of Savannah with 15,000 prisoners. Our Brigade is detailed to work on the R.R.. Marched 2 miles back the pike where the order was countermanded on account of bad weather & we went to camp. I am on the Water Committee Received Forney’s War Press from Coz. R. L. Clark. Working on the R.R. leveling off the stones ready to lay the ties. Also cut a great many ties. Part of our force was cleaning out the tunnel which had been blown full of rocks from the sides by the Rebels. Two Brigades of us were at work today. 4 Batteries came today. Received 5 letters, one from Coz. Mattie, in which was one from Miss R. S. Neel of Reisterstown, Baltimore Co., Md., one from Coz. Maggie, one from Coz. Ele. Black, one from Aunt Lizzie Thompson & one from Bro. Robert. Today we were marched 2 miles down the pike into a field where we were inspected (our Brigade) by Gen. Negley. Received the traveler’s guide this evening. Received letter from Coz. Lib. Wrote to Bro. John & Sister Rettie. This P.M. we worked at the tunnel, this nearly finished. Rained hard all day. We received orders to be ready to march at 7 A.M. tomorrow. Started at the time appointed with our knapsacks on our backs for Bowling Green, where we arrived at 5 P.M. Passed through very fine country, where there had been several encampments We had a fine day, marched 20 miles & were very tired & were glad to encamp, which we did on the right of the R.R. & on the bank of Barren River. This is the second time we have marched on Sunday. Walked down the R.R. to R.R. bridge which had been blown up before Gen. Mitchell (who was in advance) reached here. It was a fine bridge, 200 yds. long. The Turnpike Bridge is burned also. As I came back I went to see a hill they had fortified on this side of the river. The works are well put up on the top of a hill. The banks are well sodded, from the top of this we have a fine view of the country & can see part of Bowling Green, which is on the opposite side of the river. We could also see another hill the Rebels had fortified further to the north. These fortifications would command the R. R., river, & turnpike & why they have abandoned what was considered one of their strongholds I cannot tell unless it was that they were afraid of being starved out. This evening a steamboat passed up the river by our camp. This morning went out to drill & while there received orders to pack up & be ready to march at 3 P.M. We were soon ready & waiting. At 3 P.M. were ordered to unpack & pitch tents. While we were waiting there was a Brigade came here from Somerset & encamped on both sides of the R.R. Wrote to Bro. Robert. Wrote to John Penny & Capt. Fulton. Received orders to be ready to march at daylight tomorrow with three days rations in our haversacks. Formed line just at sunrise. Our knapsacks are hauled for us. Marched to a flat piece of ground recently overflowed by high river where 9 teams & some artillery were swamped in the deep mud, horses sunk into their bellies in the mud & could not be got out. Others were lifted out with rails. We could hardly get to the river shore. There was 2 steam boats abreast in the river & flat boats from there to the shore. On these we crossed, then went ¼ of a mile, stacked arms & waited untill the teams crossed which took untill 1 P.M. We then took the pike through Bowling Green which is a small town with some fine buildings & at one time contained 35.00 inhabitants. Saw 3 other forts, one higher up the river & one lower down. The Rebels had stabling put up for their horses. 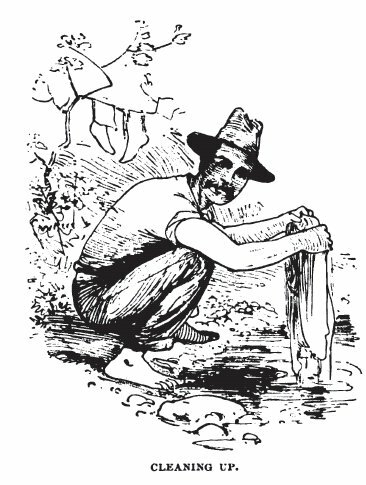 Passed a very large spring called “Sinking Creek” which bubbles out of the ground over a short distance & passes out of sight in a cave. Saw some very fine buildings & were many times cheered by the sight of the Stars & Stripes flying to the breeze by Union Citizens. We passed through Franklin, a town, small, but well built. We encamped at 1 P.M. 1 mile south of Franklin. On the evening of February 12, 1862, the camp of the 77th Pennsylvania, 79th Pennsylvania, and other regiments of McCook's division, "was in a blaze of enthusiasm." Word of successful movements of gunboats on the Tennessee River and Burnside's North Carolina Expedition reached Munfordville, Kentucky, and the Lancaster County soldiers anticipated joining the forward movement--finally marching on Bowling Green--at any moment. In fact, the move had already begun. What the Pennsylvania soldiers did not know was that the Army of the Ohio's commander General Buell had selected General Ornsby Mitchell's division to lead the attack on Bowling Green, a fact that would have horrified them after the hard work of picketing along the Green River without any real action for two months. Ben Ober appears not to have been too worried based on the information he had, though. He might have just felt lucky to be alive, as he was very sick and his death was rumored the previous week in the Lancaster newspapers. Last time we heard from the 9th Pennsylvania Cavalry, which included Capt. John Wise's Company F from Lancaster County, it was shortly before Christmas and the regiment was drilling at Camp Andy Johnson near Louisville. On February 4, 1862, they arrived at Munfordville--where the 79th Pennsylvania had been since mid-December--and enjoyed a reunion with friends from back home. The letter, written by an unidentified officer in Company F, 9th Pennsylvania Cavalry, began by recounting the Battle of Rowlett's Station on December 17, 1861, in a way that shows how large its memory had grown to the Union soldiers around Munfordville. 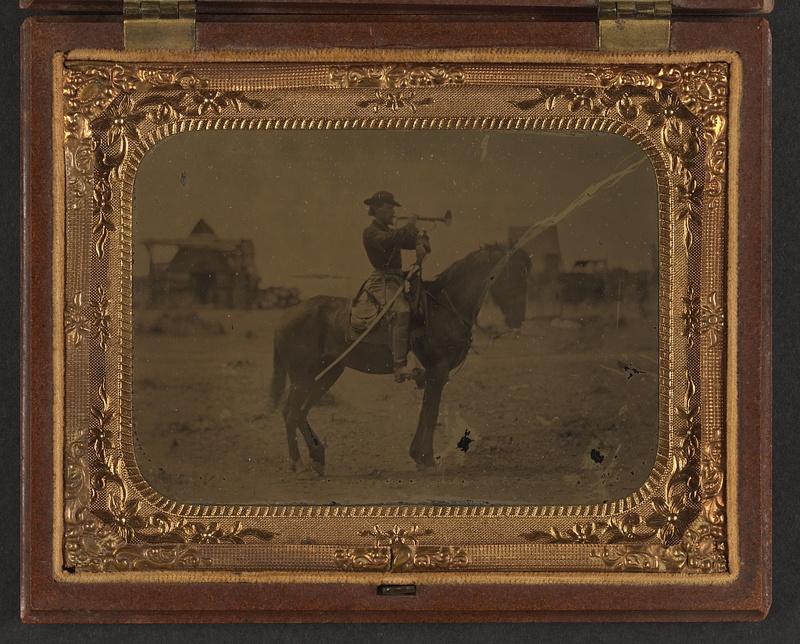 Next, "Cavalier" remarks on how the cavalry had superseded infantry in scouting missions out into the surrounding countryside--probably a good thing for the Army of the Ohio as the infantry regiment as scouting force was an accident waiting to happen. 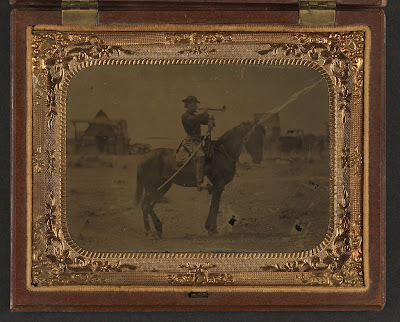 Finally, our cavalryman tells of encountering the 79th Pennsylvania. As the ship of Civil War Sesquicentennial sails on, I need to jettison a couple drafts of posts from my little canoe to try to keep up. Most of these posts are related to the Lancaster home front, and were conceived under the delusion that I would have a few hours to compile various primary sources to put together a story. Unfortunately, I haven't had time, especially of late, so I'm just going to note each post and provide references or pseudo-references so anyone trying to tell the story of Lancaster and the Civil War can find them. Muster Rolls by Company. 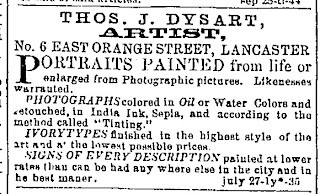 I still need to post these as a reference, although they were printed in the September and October 1861 editions of the Intelligencer and LEH, which are available online. The Election of 1861, voting by soldiers in the 79th Pennsylvania, and the ensuing lawsuits over the validity of their votes. Deaths in the 79th Pennsylvania, December 1861 - February 1862. Let me know if you have any questions about any of these topics. I'll be happy to clarify or expand upon anything I've written above for anyone interested. Anyone who makes the very worthwhile visit to Woodward Hill Cemetery--one of two big cemeteries in Lancaster City--will find it hard to miss the rather stunning grave stone of Capt. John H. Dysart, which ranks among my favorites in a cemetery full of beautiful stones. 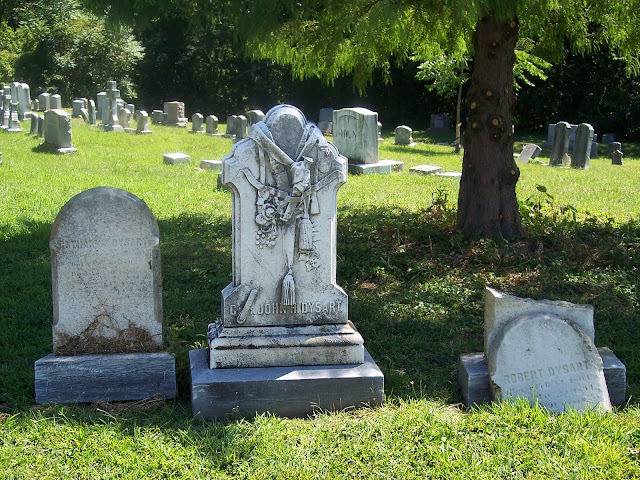 Dysart was the first officer of the 79th Pennsylvania to die during the war, succumbing to illness in a Louisville hospital on February 8, 1862. 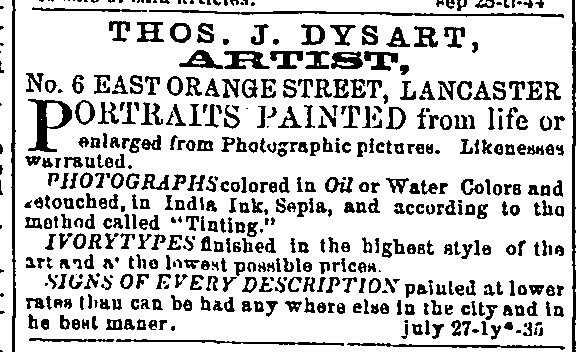 Rumors of a serious illness of typhoid fever had been printed in Lancaster's newspapers in the weeks preceding, and news of his reached Lancaster on February 10. The Daily Evening Express eulogized, "To the honor of his memory it should be written, that, as a man, he was as kind-hearted, humane, and generous, as he was patriotic, loyal, and efficient as an officer." 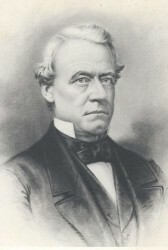 More privately, Lewis H. Jones connected Capt. Dysart's illness to his exertions trying to help Private Joseph Maxwell--Jones' brother-in-law in Dysart's company--in Maxwell's last days.